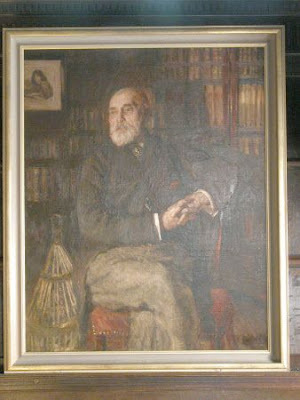 Befitting to a literary man, this portrait shows William Rossetti in his study, at 3 St. Edmund's Terrace, Primrose Hill, London, which was his home from 1890 until his death. In the top left corner is a version of ‘La Donna della Finestra’ (1879), by his brother, Dante Gabriel, whose tie pin he is shown wearing. The unidentified creature in a cage in the bottom left corner, possibly an owl, is perhaps a reference to William's interest in animals: his journal of the 1890s records regular visits to the Zoological Gardens near his home. ‎" Elegy for Darkness-The Lady of Shalott "
Arthur Hughes - Bessy Cove. c. 1899. Helen and Cassandra by Frederick Sandys.